This is a more flamboyant 5-Element Pagoda that consists of five colors, each representing its individual element according to Tibetan practice. The 5-Element Pagoda can entrap and imprison strong earth energy 5-Yellow and Illness Star#2. Earth energy is particularly magnified in the Period 8 which is an earth period, therefore a strong antidote like 5 Element Pagoda will work wonders to address problems associated to them. There is a secret compartment designed at the top layer for you to fill it up with 4 Dharmakaya Relic Mantras and natural Citrine (representing earth energy). In year 2018, one can display this pagoda in the North and the West. 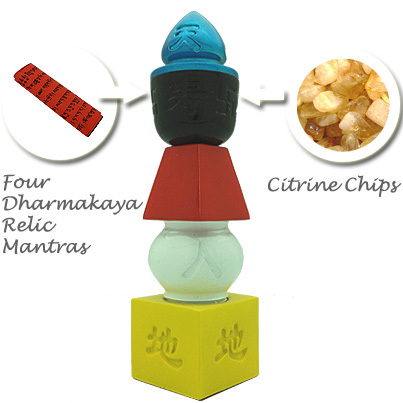 Note: This pagoda comes with free "4 Dharmakaya Relic Mantras" and natural citrine. The stack-up of the pagoda had been screwed together tightly and sealed by the factory except for its top layer, therefore it could be difficult to unscrew each layer. Anyway, it is unnecessary to unscrew each layer for it to function. For your convenience, this pagoda will be pre-filled with the free mantras and citrine before we ship. What the 5 Element Pagoda symbolizes and how to place this object? The stack-up of five different shapes (in three dimension) represent the productive cycle of the powerful five elements, which is the basis of everything in Tibetan Buddhism and Feng Shui. Display the pagoda in the locations of 5-Yellow or Illness Star#2.